Did not complete it if visiting Bangkok, without tour along the river Chao Phraya. Bangkok river, that divides the city from north to south. Has calm waters dark brown, the Chao Phraya river is always crowded both day and night. During the day, the river was filled with ships carrying goods. But the growing darkness, the river looks festive with tourist boats at night. river which has the meaning 'river king' In the afternoon, a number of legendary place we can meet along the river. Starting from the Grand Palace in Rattanakosin area, Wat Pho or buddha statue is resting (reputedly the world's largest), Wat Arun, and Chinatown. Not hard to enjoy a tour along the river. Many small dock and a boat that is ready to carry hundreds of tourists. The price also is full of options. For foreign tourists provided the blue-flagged boat which means it can be used equipped tourist guides, for once, up 25 baht. The boat began to operate from 06.00 hingga19.00. But if you want more like freely, provided many special boat tours that can be rented at the rate of 500 baht per person. At nightfall, hundreds of people will fill the docks in the river. They wait their turn to tour the ship transported night. Dinner and the crew was waiting in the distance. Sparkling decorative lights and the music sounds add to the atmosphere more lively. While enjoying the skyscrapers that adorn the city of Bangkok, on the boat we could feel the cool night breeze. Already hundreds of years of the Chao Phraya river become alternative transportation routes for Bangkok residents. Chao Praya river wading become the major tourist attractions when we travel to Thailand. Chao Phraya River is the longest and most important river in the country of Thailand. Has a length of 372 kilometers which flows from northern Thailand to the Gulf of Thailand (Gulf of Siam) in the south. 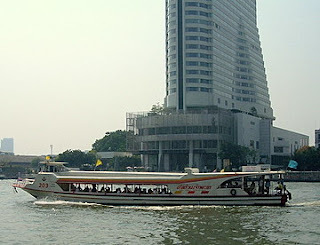 Chao Phraya river is located on the Ping River. 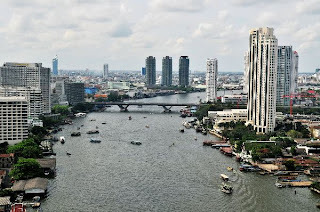 If examined further, Bangkok become rapid in development like no other now because of this river. The river continues to be built to address the problem of flooding in Thailand especially in Bangkok. Thousands of ponds are designed to be beneficial to the surrounding community.